I'll start by saying, Halloween has never really been my holiday. 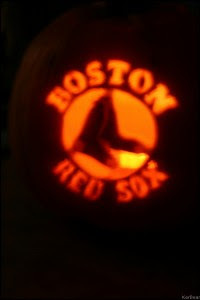 I've never really had fun dressing up and I found the emptying and carving of pumpkins more work than it's worth! However, every year I get into it and have spent hours upon hours creating and sewing together costumes (never in my life have I store bought... by 13 I was sewing my own costumes! 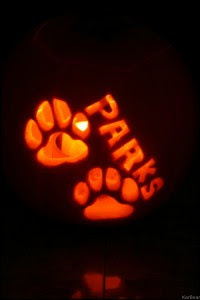 ), and finding the perfect pumpkin pattern. I figure, if I'm going to do it - I might as well make it worth it! Well, as usual, this year I've left all of it until the last minute. Alright... it's a little more extreme this year since it's two days before the big days and we have NO IDEAS for costumes OR pumpkins. 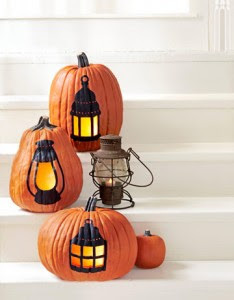 So today I have spent a great deal of time hunting down the perfect pattern for the pumpkin I hope to be carving tonight. 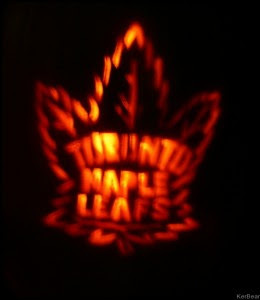 They may have their problems - but I'll always love my Leafs! B is a true blue Red Sox fan. A little girl who saw it even brought her Dad back to see the pumpkin, and he knocked on the door to compliment us on it! 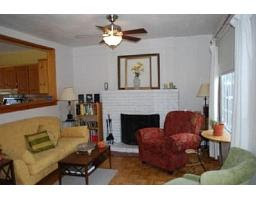 I recently found the inspiration for redecorating our not so pretty living room (see picture below - this is from the MLS listing - all the furniture belongs to the previous owner... but you get the idea). Our living room is the first room in the house after you come in from the built on foyer. Right now it's split up and part of the room is carpet (where the picture is taken from) while the majority is parquet. Now I've seen some houses were parquet looks beautiful - but in my case it just reminds me of the horrid apartment we lived in for five months before purchasing our house - so it seriously needs to GO! I'm dying to redo it (and the whole room), but right now our budget is very tight. So, knowing that it would take some serious deals to get the project rolling I turned my search to Craigslist. The area itself is not too large, and B assumes we wouldn't need more than 250 sq ft of hardwood to do this area. So the other day I took some time to scour the Craigslist listings, when to my delight, I stumbled across a listing for 230 sq ft of Canadian Red Oak for $250! Now, the thing is, the guy who is selling it is an installer, so it's a bunch of different sections of already stained floor that was left over from other jobs he did. So we'd either have to refinish it ourselves or get the pros to come in. B assumes we can get it done for a decent price, over a weekend while we are away. The big bonus - B and my Dad could install the floor together (my Dad is an all around handyman) and we can still stain it whatever colour we want. I was seriously excited and even B thought it was a great deal (he's not always the easiest to convince). So - B called the guy who listed the wood and should hopefully be meeting up with him on Sunday to make sure that everything looks good. If it does, the wood will be ours. Now I don't expect we'll be laying it anytime soon, as our first priority it to replace our furnace, water heater and A/C in time for our tax rebates! However, I'll feel happy just knowing we have the material and are ready to install, hopefully sometime early in the new year. For now, I am working on our mood board, and trying to come up with a plan for executing our reno as it will involve a lot of work (which I will share another time). I also plan on taking on a few smaller projects that will contribute to the final plan for the room. I'm just happy that I was able to find the materials we need for our floor for a great price! Just proves, it pays to be open and flexible when doing home renovations! So... it's Sunday afternoon (2:30 to be exact) and I'm feeling that I was a little over ambitious about our bathroom vanity project this weekend. I mean, we've been pretty productive... but I can guarantee we won't be using our upstairs bathroom to brush our teeth or wash our faces tonight or tomorrow! Thursday evening I sanded and primed our medicine cabinet to begin the whole process, but left our vanity in place as I wanted to be able to get ready for work upstairs on Friday rather than have to venture all the way down to the basement early in the morning. So, Friday evening I got the first coat of white on the inside of our medicine cabinet (B wasn't able to pick up our mirror yet...). We emptied the vanity drawers, got the sink out and moved the vanity out to the garage where we started the process of stripping it. Aside from the drawers, stripping it is definitely what took the longest! Our vanity wasn't completely stripped until early yesterday evening! Yesterday was less productive than we liked as we were out picking out pumpkins in the morning. On the way there we stopped by a different ReStore than we tried earlier in the week and lucked out. We found the perfect white sink for only $20! They also had some great paintbrushes there for $2 each so we grabbed 4 - we can never have enough paint brushes around here!! This morning I had other plans, but B was nice enough to fill all the holes and burn marks in the vanity (seriously... it was so rough) and get it primed. I got home around 1:30 and finished priming our drawers. We have something else to do this afternoon and won't be home until after dinner I am sure. Tonight I hope to get the first coat of white on, and hope that by Tuesday or Wednesday I can share the big reveal with everyone! At this point, I realize that the "before" pictures of my vanity were a little too small in my last post. So I will share them again. 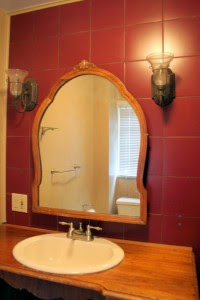 Take a peak, and I hope to be sharing our new bathroom vanity with you all very soon! 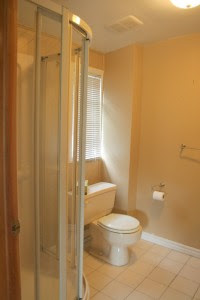 When we first saw our house I was torn about the upstairs bathroom. 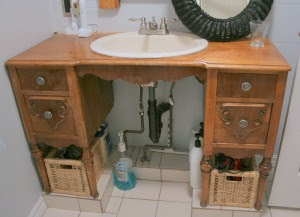 It was small with only a tiny shower stall, but the most beautiful old wooden vanity. 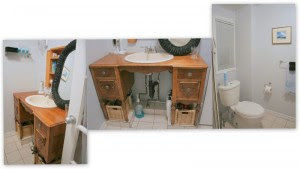 At some point someone who lived here had turned it into the bathroom vanity and made the mirror the door to a medicine cabinet! So beautiful and charming. It won me over so much it actually took away from the fact that the colours in the bathroom were absolutely horrendous! During our final walk through before moving in, I realized just how BAD the bathroom was! 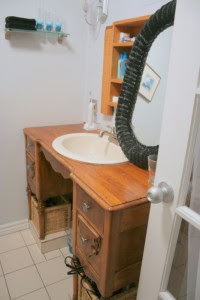 The colours were way too much for that tiny bathroom and there are just no words for the awful tile they had on the wall behind the vanity. Once we actually moved in I also realized how much I hated the almond toilet, shower stall, sink, outlets and light switches!! ALL ALMOND! So of course, freshening up the bathroom was on the top of our priority list the day we got the keys! Oh - and I best point out... the glass in those sconces is NOT frosted... it's dust! YUCK! So - once the keys were in our hands everything came OUT of the bathroom, primer went on the tile wall and the following morning a fresh coat of light blue paint went on. The new paint alone made the bathroom look so much bigger! After taking the sconces off the wall we threw the glass into the dishwasher and sprayed the sconces themselves with aluminum paint to give them a fresher look. They looked great once they were back in on the wall. I haven't had much time to write this week. Things have been a little stressful around our home as we prepared for a few house guests this holiday weekend. A friend of mine from University stayed with us Thursday night on her way home for the holiday, followed by B's parents arriving on Saturday to spend Thanksgiving at our house... oh yes, and it will be their FIRST TIME seeing the house in person!!! So there is quite a lot to be done! Growing up, Thanksgiving is something that was never made a big deal of at our house, but something we always celebrated. Somewhere in there I came to love it, since it was always more laid back and still all about family. I then loved the holiday even more after celebrating American Thanksgiving with B's family for the first time two years ago. 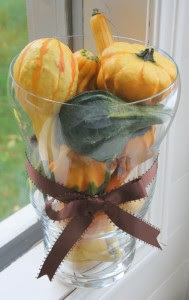 It's made me really want to make a bigger deal about Thanksgiving... especially with decorating! (What's better than that?) But of course, with buying a new house and all - our holiday decorating budget is pretty tight! 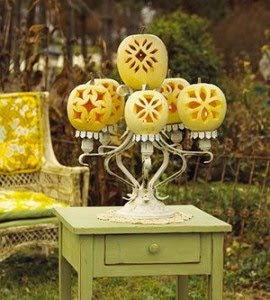 So this past week I've spent some time researching and seeing what I could find in the way of inexpensive decorating. 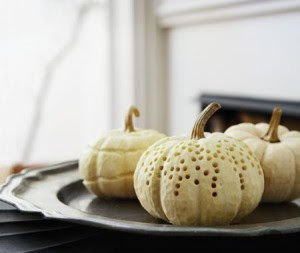 My centre piece for our dinner came easily after picking up the October issue of Canadian House & Home. 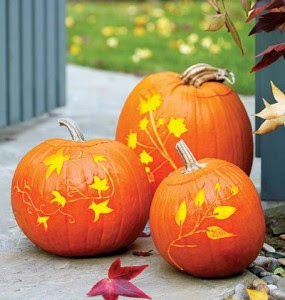 Aren't these Pumpkins just absolutely adorable? So the other weekend I went out and picked up a couple of small white pumpkins (as well as orange) and a large sized white one. The larger one I plan on painting "Welcome" on the front in cursive and place it in our front entrance. 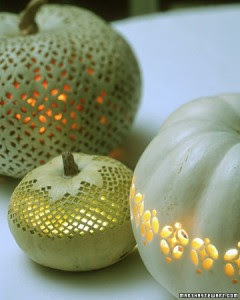 At the time of picking up my pumpkins, I also picked up a big bag of assorted gourds. I wasn't too sure what I was going to do with them at first, but eventually decided that I wanted to display them in a nice vase in our living room. So the other day I ran down to our local goodwill and found this wonderful vase that I was able to pick up for $6!!! Can't beat it!The brown ribbon is HALF of one left over from a house warming gift we got - so that was free!! The display itself cost me $10 and even B commented that he thought it looks really great!! I continue to search for other ideas I can put into place before B's parents arrive tomorrow. I'm excited to get everything in place... and I'll be sure to share more photos after our weekend! Before we moved into our house my brain started to spin with ideas on how to solve our biggest issue (in my eyes)... closet space! From the first time that we walked through our house, we both knew that the little broom sized closet in what was to be our master bedroom was not going to cut it. Even though we had agreed that B (my boyfriend) was going to take the small closet, while I made use of the larger closet in the second bedroom, we knew that we were lacking in clothes storage. While living in our apartment we had used the dresser that I had, had at my parents since childhood, and we agreed that since it didn't fit with the feel of our house, it wouldn't come with us. This of course left us with an issue - where would we find affordable dressers that would fit with the cottage feel of our new little house? The hunt was officially on! I endlessly scoured websites and visited our local goodwill to see if anything caught my interest, but no luck. Finally, one Friday evening our prayers were answered... by the garbage dumpsters behind our building. While bringing the dog in from a walk, B happened upon an old dresser left for the dump by one of the other residents in our building. When he first showed me his find, all I could think was how ugly the sad looking dresser was. The finish was absolutely destroyed, the hardware was broken and some pieces even missing and there were problems with a couple of the drawers and the back. After giving myself a little time to look over it throughly, I was able to see the hidden potential. Together, we loaded the ugly dresser into B's truck and brought it along to my parents (a.k.a our temporary storage facility/workshop) to give it a new face lift. We took a little longer than we anticipated to decide what to do with the dresser, and with less than a month left until the big move we knew it was time to get to work. 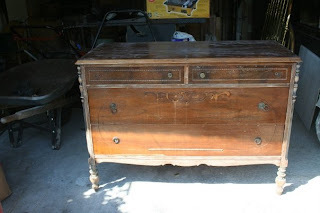 We started by sanding down the old dresser, prepping it for a nice fresh coat of paint. B then took a chisel and removed the beading detail that I hated on the smaller drawers. 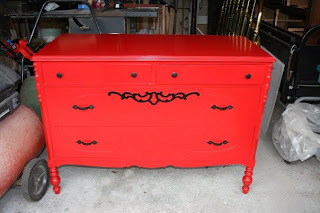 When all that was said and done, it was time to get the paint on the dresser. I had originally hoped to find little crystal or glass knobs for this piece, but I couldn't find any and ended up being really happy with the black ones we picked. The combination of the red and black reminded me of a barn which, in a crazy kind of way, I thought would fit in our cottage style home. The black handles also inspired me to use some left over high gloss black paint that my Dad had laying around to fill in the detail on the middle drawer. It was that last bit that I think really brought the whole piece together. 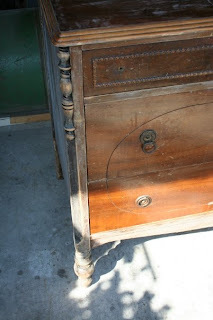 This dresser is now in our second bedroom/my dressing room and is definitely the focal point. We have a little work to do fixing one of the drawers and replacing the backing - but luckily B is handy and both him and my Dad always have extra wood laying around. So we already have the materials.... it's just a matter of time! 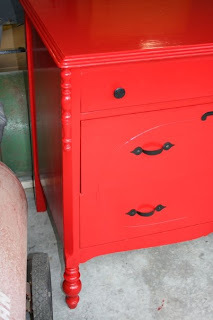 Having a one of a kind dresser that we refinished: Priceless!! I emailed an old friend who now works in real estate and told him we were ready to purchase. He came over to our apartment, talked us through the process and what to expect, we signed an agreement, told him what we wanted and a few days later he sent us a bunch of houses in our desired location and price range. I sifted through the initial batch and when I came across our house - it was love at first sight. Everything about it was perfect - the entrance, the kitchen, the skylights in the bedrooms! Without ever stepping foot in the house, I could see us living there and THAT, I was told, was what finding your perfect house was all about. Of course, knowing what my boyfriend's reaction would be if I told him this right away ("don't get sold on the first house you see! "), I treated it as a "top pick" and placed it amongst the other "potential candidates". We looked at my "finalists" list together, managing to narrow it down to our top six, which of course included our house. When I emailed my friend a few days later, I made sure to stress to him how badly "we" wanted to see that house. I was actually so excited about seeing our house that first night, I could barely concentrate on the first place we looked it. With a great location, but very little character, I just couldn't get excited about it. From there we headed to the house that would soon be ours, and after seeing it in person I loved it even more. My boyfriend admitted that he liked it, but had his concerns and wanted to make sure we saw a few more before we committed ourselves. I understood where he was coming from, and spent the next few days trying not to get my hopes up as we waited for our next evenings of walk-throughs. When we headed out for that second night, I was pleased to learn that our agent had set up a second walk-through of our house. After checking out a couple of other houses that just didn't quite do it for us, we went for another spin with more of a critical eye. My boyfriend maintained that he had concerns about the basement, but after talking it over we agreed that this was the house we wanted to put an offer on. Without waiting a moment longer (as we didn't want our wonderful find to be snatched away from us), we drafted up an offer that night and our agent presented it the following morning. After a bit of back and forth, we got the good news that the house was ours! We called everyone we could to share the good news and then celebrated, all the while I was silently freaking out that I had just made the single largest purchase of my life (along with my boyfriend of course)!!! After my minor freak-out subsided, all of the ideas, dreams and wishlists of what I wanted to do started to pile up. However, as a young couple, purchasing our first home, I knew that I would have to find a way to do it on a budget, and thus, my material for First Time Fancy began to develop without my evening knowing it. A few minor hiccups along the road to home ownership, but we survived (barely) and on July 17th we picked up our keys from our lawyer and began the work that would turn our little house into the home we always wanted!